Digital World: Suppose 10th january 2016 is sunday. 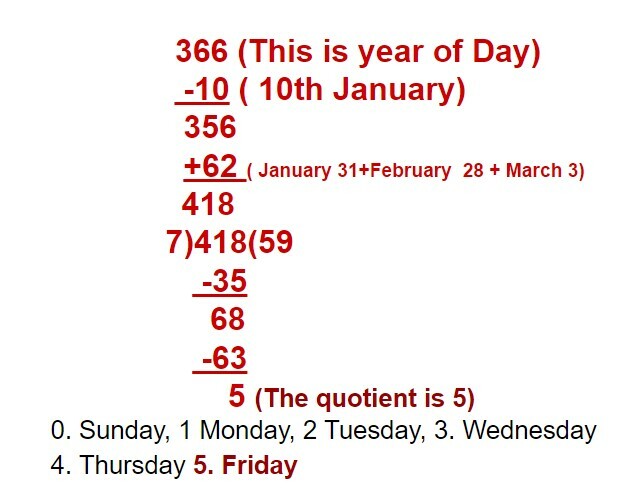 What is the day of 3rd march-2017 ? Hi guys, I am Humayun Kabir. Many of you are thinking, and it is periodically a problem in a variety of experiments, many are trying to solve. Can or can not. Today we will discuss the issue. Let's go ahead and get started……………. Q: Suppose 10th january 2016 is sunday. What is the day of 3rd march-2017 ? Do you know how many days are in a year? Of course 365 . 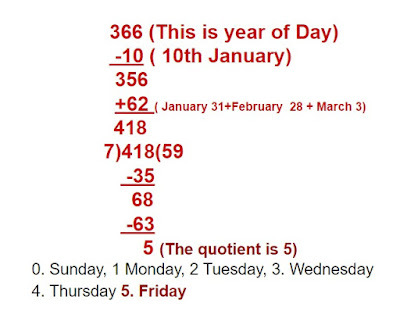 If it is a leap year and 366. Since 2016 leap year. So I take 366. Now, given that, on January 10th. So we subtract the number 10. Now, The results add to the number. The question of the January 10 date was Sunday. This is the result. Which is why so much trouble.